Dim the lights grab your popcorn and let the show begin at Show Reel Bingo. Now the games are about to start in this riveting online bingo site of theatrical talent for nonstop action. The casting call is auditioning for bingo players and you are invited because the search includes a cast of thousands. The requirements include: must love bingo, must love cinemas and must love having a good time while playing. This adorable cinema themed bingo site made its debut in February 2012 with a homepage that characterizes the silver screen. It’s a home theatre where the audience is the bingo community. Bingo Chat rooms are a friendly atmosphere where bingo roomies can place each other on a Buddy List with notifications when they are in a chat room to join them. They are a member of 15 Network and powered by QSB Gaming. Show Reels Bingo is licensed and regulated by the Alderney Gambling Control Commission. No download is necessary and players can launch games immediately after registration. What is admirable about the games is Show Reels utilizes its own software offering a completely refreshing gaming experience. Play in multiple bingo rooms at one time by clicking the Go button that will a launch players to a new game and purchase cards in the 90 ball and 75 ball bingo rooms. Bingo tickets cost from 1p to £1. Quiz games are free to play for all depositing players. The Specials page is loaded with events including Chat Games, Tourneys, Guaranteed Jackpots, Parties and an entire line up of entertainment. Gather your friends for Team Bingo that takes place every Tuesday and Saturday to win lots of Loyalty Points. Access the Table Games, Slots and Scratch Cards from the lobby or inside a bingo room. An array of slots is offered with up to 100 pay lines. Blackjack and Roulette offer a nice collection of overall games to choose from. Players are in for a special Welcome Deposit Bonus and don’t stop there with the generosity. You’ll take a spin on the Wheel where you are guaranteed to win a bonus between £10 and £2,500. All funded players are gifted with two cinema tickets to see any film of their choice and any cinema of their choosing. Finally, players are invited to a Free 30 day trial to LoveFilm and watch a library of films from the comfort of their homes. Monday’s will never be the same with Monday Madness that takes place from 4pm – 7pm every week. See what they have in store for you as the Full Houses and 1 line prizes are all switched up. Friday Night is Party night with the Chat Moderators as your host while you engage in some exciting Chat Games. The Weekend Wad happens every weekend and players who bingo on a Full House with the Golden Number shares in a prize pool of 250,000 Loyalty Points. Earn Loyalty Points while in the bingo rooms while playing Chat Games and participating in the Tourneys. Every 1000 points collected is worth a £1 Bonus. Refer a Friend and when they wager a minimum of £5 you will be rewarded with 5,000 Loyalty Points. Playing more in more than one bingo room at the same time is a nice multi-game feature. The Buddy List creates a warm close knit community of players. We rate Show Reel Bingo with 3.25 Pink Hearts. Registering at this site was really simple. Their welcome bonus was made up of £20 free to play with as long as you make a first deposit of at least £10. I didn’t think this was too bad. I also thought it was really cute that they’ll even throw in a free box of popcorn for signing up! The Bingo that you’ll get here consists of 75 and 90 Ball varieties which is pretty standard. There is a huge collection of patterns that can be played when it comes to 75 Ball though, which makes up a bit for the lack of variety. The slots are another story! They offer a series of thrilling slots with fun features sure that can’t be beat. Popular games include Doctor Love, Amazon wild and Slots with up to 100 lines. Instant Games and Scratch Cards can be found as well. I didn’t really see too much set in stone as far as free bingo, but they still offer some really nice promotions including freebies every once in a while. If you like movies and movie memorabilia, then Showreel Bingo is going to be one of your favorite stops on the internet bingo circuit. After you join and make an initial small deposit you will also be gifted with a movie themed prize (currently a movie on DVD). They also have promotions available that will reward you with cash, movie tickets, memorabilia packets, and other movie-themed items. The bingo is not so shabby, either! They have 75 and 90 ball games and don't forget to play the Spin the Wheel game for your chance to win up to $2500 pounds of bonus money. There are chat hosts in every room so be sure and participate while you play bingo and get yourself some bonus money so you can play more. 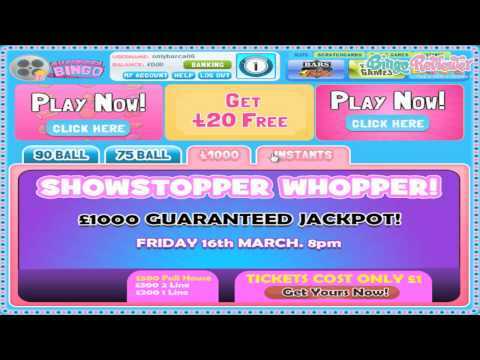 There are also instant games and slots and scratch cards for the players who sign up at Showreel Bingo. Looks as though this site is pretty popular so I hope you enjoy playing here and do some nice winning as well! I like this site a lot, combining my two favorite things, Bingo and movies. Enough to say that you get a free DVD movie on successful registration. Oh, and a £20 bonus on your first £10 deposit (basically a 200% bonus), and one Spin the Wheel play where you can win from £5 to £2,500. Needless to say that I won the smallest prize. There are only 75 ball and 90 ball games, which is a shame, specially because I start to play more and more the fast paced 30 ball variant (or 5 Line or Sweedish bingo). There are a lot of interesting bonuses, like monthly and weekly giveaways, so if you plan ahead, you can get some good cash. There are also nice Chat games, and if you are a Team player, you will be happy to know they support a Team Bingo play. Almost forgot they have lotto, for those who like to play that type of game. NEW PLAYERS ONLY. MIN DEPOSIT £10. £8 MAX WIN PER 10 SPINS. MAX BONUS CONVERSION £250, 65X WAGERING REQUIREMENTS AND FULL T&CS APPLY.